This tutorial specifically covers Logos 5 but things should also work in Logos 4 though the menus and tools may be in different places. 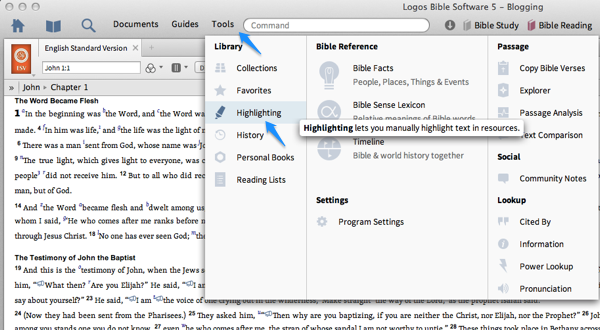 To get started you need to open the highlighting tool. 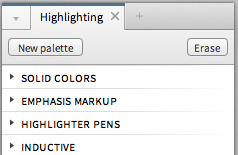 Click on Tools and then Highlighting. Voila, the text is now highlighted. The option I tend to use is Save in: Most recent note file. When I begin work I will ensure that I have one notes document open in Logos for the specific task I’m working on. That becomes the most recent note file and all my highlights and notes go in there. Be careful that you don’t end up with two notes documents open or your highlights will go to the one you last accessed. Remember that you have to change the Save in setting for each palette. You can highlight a number of different highlights on the screen, right-click and click Remove annotations and all selected highlights will be removed. I like to have my Logos Bibles look like they’re underlined in pencil just like my real Bible. To do this, I’ve created my own highlighters. It’s super easy to do so I’m going to show you how. This is a great place to play and personalise how your mark-up your books. Don’t be scared to create various styles or duplicate and modify existing styles from other palettes. You can also move styles between palettes. Don’t forget to change your Save In: setting for your new palette. If you have to click the specific highlighter every time you want to highlight something, it becomes a little tedious and you have to always have the highlighters panel open and visible (which means you can’t use the screen for other important documents). To solve this, you can set keyboard shortcuts to your highlighters. 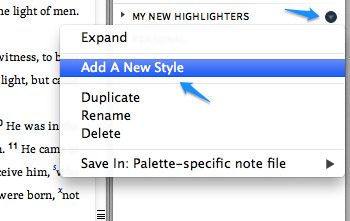 Let’s add a keyboard shortcut to our new highlighter style. 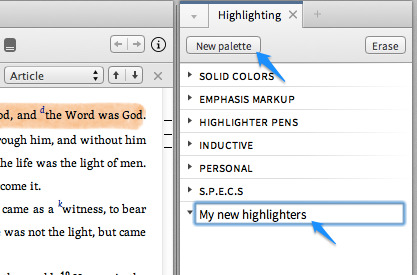 Now you can highlight text in your book, click U on your keyboard and your text will be underlined in a nice pencil line. I hope this tutorial was helpful and clear. If it wasn’t or you have a question, please feel free to ask in the comments below and I’ll do my best to answer them.